Have you ever lost any email from your Gmail account? Although, that is seldom happen but the Gmail user should consider backup the email frequently if their mail is critical. They may consider using Gmail Backup. Gmail Backup is the tool that allow Gmail user to regular backup of their mail and restore when necessary. Gmail backup will backup all the mail including the mail information such as labels, date, from and etc. It using the Gmail built in IMAP capability to backup the email and save the messages in Microsoft EML format which allow restoring to other mail client such as Microsoft Outlook. The Gmail Backup is available in two version which are Windows version and Linux version. The Windows version comes with a user friendly interface that just enter your email address and password then select the folder where you want to backup to. After that, click on Backup button to start perform the backup. While, the Linux version is in command line only. 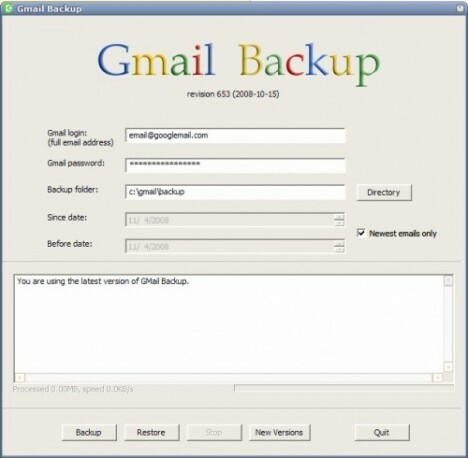 The Gmail Backup is a freeware and available to download from www.gmail-backup.com/download.